SKY MAP: Jupiter and Venus as of 8 p.m. from mid-northern latitudes on Sept. 1, 2005. Last week we highlighted the planet Mars, which will put on a spectacular show this fall. But there are two other planets, even brighter, that are now visible in the west-southwest sky right after sundown. Come the evening of Sept. 1, these two planets -- Venus and Jupiter -- will pair off in a striking conjunction low in the western evening twilight. Venus has been languishing low in the dusk all summer; struggling up from the horizon hazes, trees, buildings and other low-altitude hazards that have kept most people from noticing it for the last few months. Now at last it is managing to stay above the west-southwest horizon during mid-twilight. Actually Venus still sets 1½ hours after sundown, just as it has all summer. But the duration of twilight shortens as summer wanes, so Venus now shines in a darker purple sky before disappearing for the night. Jupiter, meanwhile, has itself been lowering in the west-southwest at dusk all during July and August. In early August it was be setting about an hour after the sky became fully dark, but now, as August is coming to a close, it's setting right around the end of evening twilight. Jupiter has been moving eastward against the stars of Virgo and toward the bluish star Spica; the gap between them was as great as 14 degrees on July 1 but will have shrunk down to 6 degrees by Aug. 31. Even more noticeable, of course, has been the approach of Venus to Jupiter. At the start of August, they were separated by over 30 degrees, but by August 31 they'll be within just 1.5 degrees of each other. SPACE.com readers may recall last autumn's beautiful conjunction of these same two planets. They appeared closest together on the mornings of November 4 and 5, separated by less than a degree. Since then, while Jupiter has lingered in western Virgo, Venus has been racing eastward, all the way around the zodiac and once again joins the largest planet, this time in the evening sky. 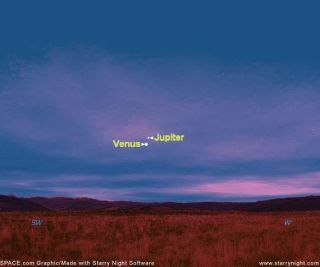 They will be closest together - Venus passing 1.2 degrees to the south-southwest of Jupiter - at 6 p.m. EDT on Sept. 1. In the 2005 edition of the popular publication "Astronomical Calendar," Fred Schaaf, who pens the monthly Observers' Highlights section, refers to the two planets as a "breathtaking duo." They will not come as close to each other again until February of 2008. Also, during the first week of September Venus makes a beautiful passage by 1st-magnitude Spica. Look for Spica less than 2 degrees to Venus's lower left on Sept. 5 and below it on the 6th. And while all this is taking place, a beautiful crescent Moon will be sneaking into view from the west. Imagine the astrological significance that the ancients might have ascribed to a celestial summit meeting such as this! So plan on using binoculars if you hope to watch Venus's busy schedule of conjunctions with Jupiter, Spica and the Moon during the first week of September. The farther south you are, the higher all these objects will appear above the twilight horizon and the better your chances of seeing them. Venus will gradually pull away to the east during the balance of September. Jupiter should continue to be visible to the naked eye on most clear evenings, at least for the first part of the month. Look for it very low in the west-southwest a half-hour after sunset until it finally disappears into the sunset glow during late September.